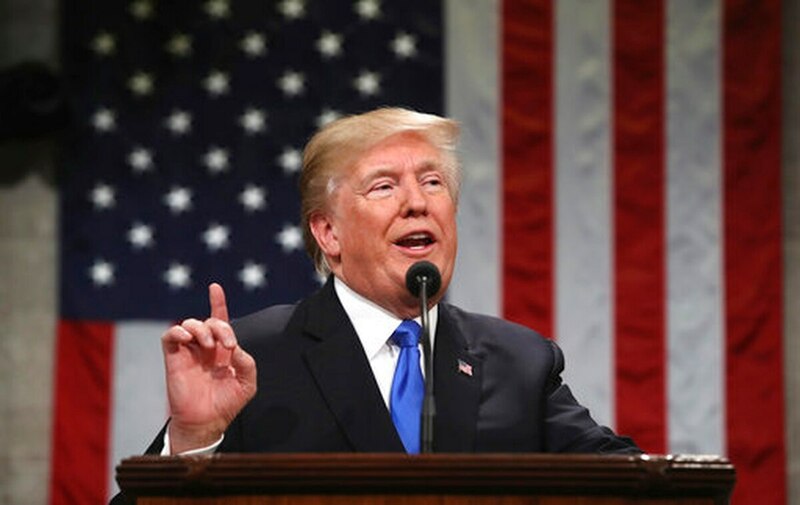 WASHINGTON — President Donald Trump again promised to rebuild America’s military might in the face of growing foreign threats in his State of the Union address on Tuesday, and lauded battlefield successes in Afghanistan in the Middle East under his administration’s new policies. The speech also included another call for lawmakers to “end the dangerous defense sequester and fully fund our great military,” echoing his still unfulfilled campaign pledge to get rid of spending caps on the Department of Defense. Prior to the speech, White House officials has said Trump’s defense focus in the speech would include “clarity about our friends and adversaries.” On Tuesday, he took aim at both North Korea and Iran, speaking at length about the threat both countries pose to U.S. national security. In particular, he promised “a campaign of maximum pressure” against North Korea for its nuclear missiles program. The country’s military missile tests have dramatically increased since Trump took office, as has the war of words between the North Korean government and Trump’s administration. Trump also spoke more broadly about the lingering threat of terrorism, nearly 17 years after the Sept. 11, 2001, attacks on the American homeland. Earlier in the evening, the president signed a new executive order to keep open the detention facilities at Naval Base Guantanamo Bay, in direct opposition to former President Barack Obama’s stated goal to close the controversial facility. “Terrorists who do things like place bombs in civilian hospitals are evil,” Trump said. “When possible, we annihilate them. When necessary, we must be able to detain and question them. Trump said that U.S. military missions in the Middle East during the last year have nearly wiped out Islamic State group fighters in Iraq and Syria, and that his new military strategy in Afghanistan has also paid dividends for national security. “Along with their heroic Afghan partners, our military is no longer undermined by artificial timelines, and we no longer tell our enemies our plans,” he said, drawing shrugs from Democratic lawmakers but applause from Republicans who frequently criticized the Obama administration for micromanagement of military affairs. Several military personnel were among the White House’s guests for the annual address, but Trump highlighted two in his speech: Coast Guard Petty Officer Ashlee Leppert, who helped save 40 lives during during Hurricane Harvey in Texas last summer, and Army Staff Sgt. Justin Peck, who earned a Bronze Star with V for helping save the life of a fellow soldier during a mission in Syria last fall. Trump lauded them as examples of heroes throughout American society, “defending hope, pride, and the American way.” He said their sacrifices should serve as a reminder for lawmakers mired in political infighting on Capitol Hill.